When it comes to adhesive systems and bonding techniques, there are a lot of options available. The latest report from the ADA Clinical Evaluators (ACE) Panel dives into the challenges dentists experience with bonding agents and their preferred bonding products. The report’s data is based on a survey of nearly 300 practicing ADA member dentists. 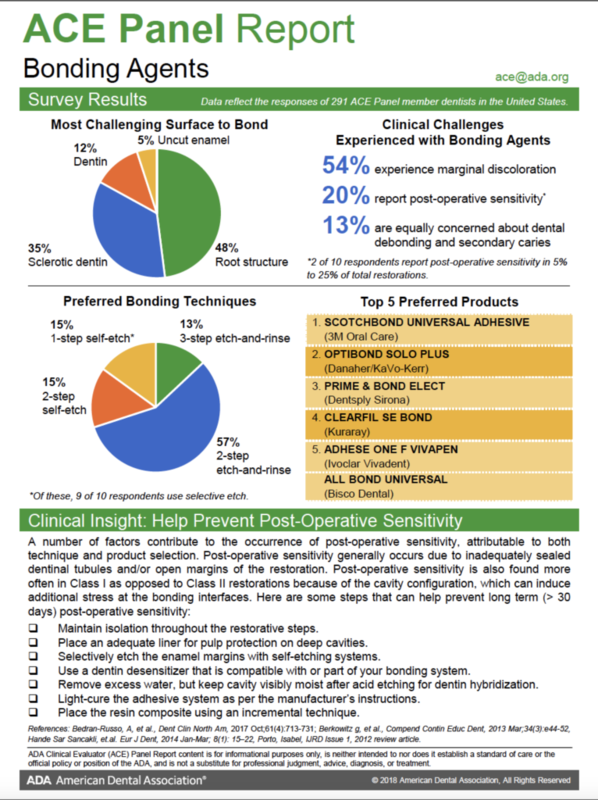 Top challenges: Learn which clinical challenges your colleagues report with bonding agents and which surfaces they cite as the most challenging to bond. Technique and product trends: Which products and bonding techniques do dentists prefer? Clinical insights: Reduce your patients’ post-operative sensitivity with these seven steps. Download the report for more trends and insights on your colleagues’ use of bonding agents in patient treatment. The ACE Panel is a network of practicing ADA member dentists – like you – who want to share their opinions on topics and products. Be a part of a network that advances the dental profession and helps you gain awareness and insight on new dental products and techniques that could benefit your patients, colleagues and profession. Join the ACE Panel today!